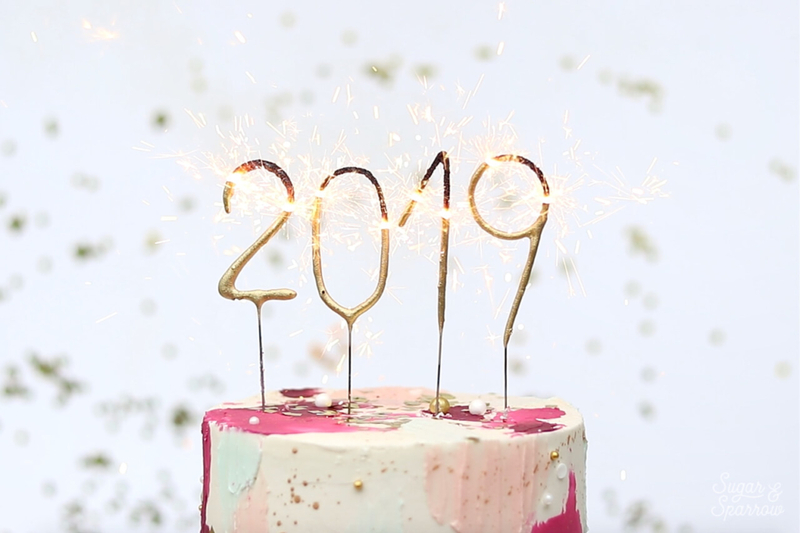 Happy 2019, everyone! 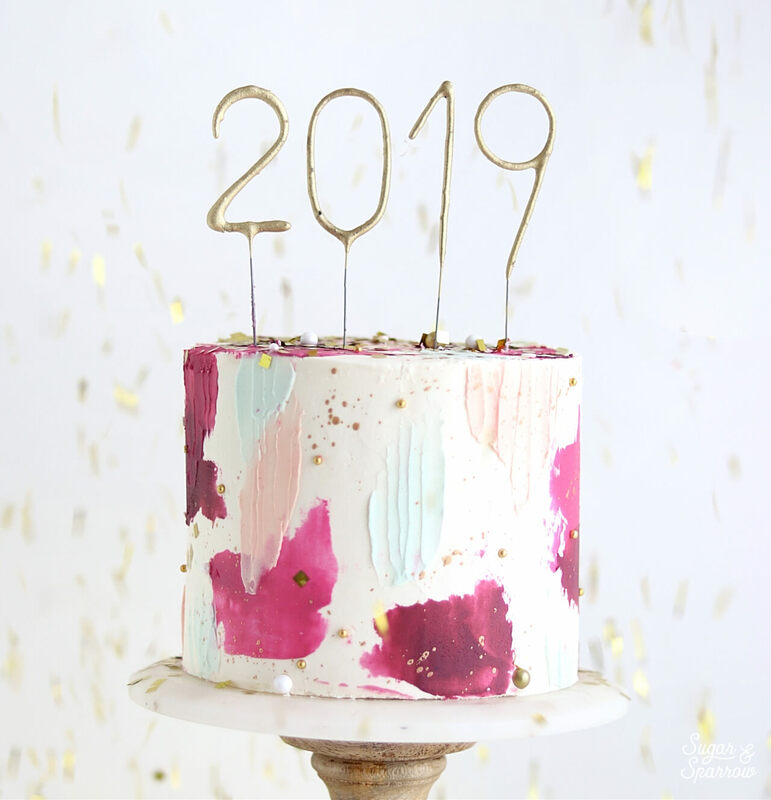 What a better way to kick off the new year than to make a cake and have a slice while dreaming about the year to come? That’s completely my jam because a) I love cake and b) I get super excited about goals. Always have, always will. I’m the kind of person who keeps daily to-do lists just so I can check things off (it apparently releases dopamine which kindof makes me an achievement addict) but as New Year’s rolls around, I take those dreams I’ve been thinking about all year and write them out. 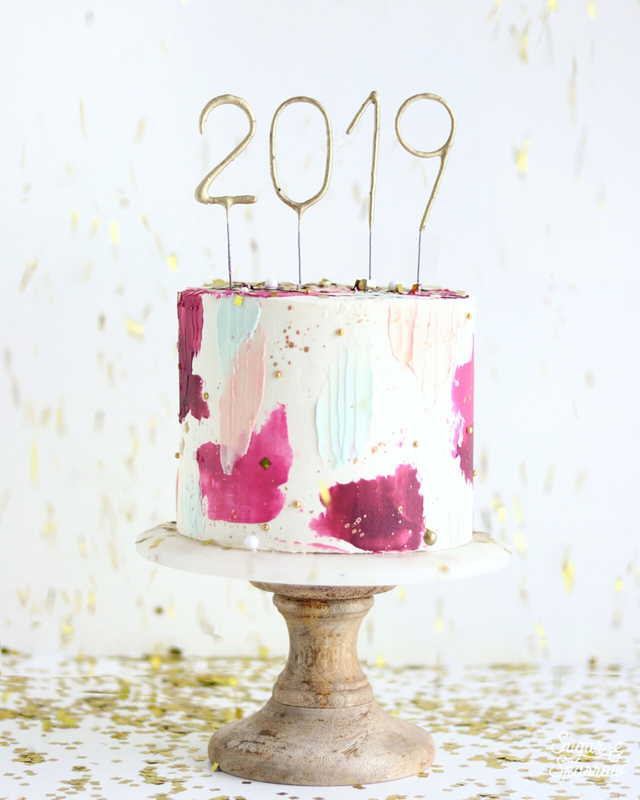 And I kick it all off by topping a cake with these festive number sparklers by TOPS Malibu. I’ve got all the heart eyes! 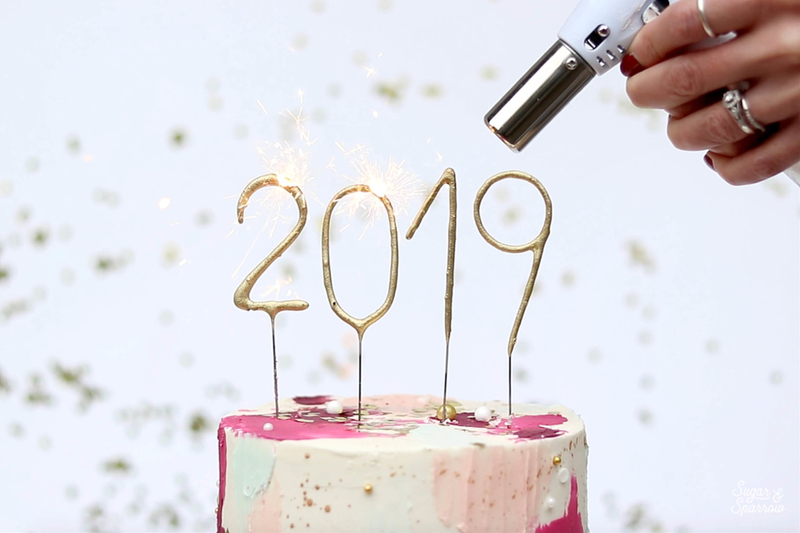 TOPS Malibu has always been my go-to when it comes to cake sparklers, and they were kind enough to send me these number sparklers to celebrate the New Year. They’ve got a huge selection of cake toppers and party supplies, so there’s something for every celebration. The thing I love the most about their sparklers in particular is that they come in all sorts of numbers, shapes, and sizes! Perfect for birthday cakes, anniversaries, cupcakes (they even make them in tiny sizes! ), and New Year’s. Be sure to check out their gorgeous collection here! Start teaching local workshops. If you’re in the Portland area, you’re in luck! I’m planning on putting together some workshop material so I can start teaching cake stuff in person. I’d love to know what you’d want to learn from me, so let me know in the comments section. There’s no real eta on that or anything, it’s definitely a dream though! Keep working towards a cookbook. So the funny thing about this whole cake blog thing is that I never really imagined my recipes working out in other peoples’ kitchens. But apparently they do! And receiving feedback from you guys about recipe successes has been so, so encouraging. It’s pushed me to write more than I ever thought I could! So with every new recipe I make, I think to myself, this could go in my future cake cookbook. I’m gonna keep it up and dream towards it! Spend less time on social media. This past year, my social media channels have grown a ton (for which I am so thankful!) but I also kindof hate that my go-to has become checking Instagram far too often. It’s that autopilot thing where my finger just clicks on the app when I have down time. Don’t get me wrong, I love Instagram, but I’m working towards setting boundaries for myself so I don’t spend so much time there. This will probably look like establishing a schedule and blocking off only certain times/days I open the app. I’m hoping it increases my ability to be more present and creative. Work out more. Ok, this is probably on everyone’s list but whenever I incorporate workouts (particularly running) into my weekly routine, my mood skyrockets. I’m nicer to everyone when I work out. So I should probably do that more. Finish my house remodel. We bought a house nearly two years ago and have completed a few major projects since then. My husband and I ripped all the carpet out and re-floored the entire house ourselves, skim coated the texture off all the walls to make them smooth, and installed a sliding glass door. Still on the list are full remodels of the bathrooms and kitchen. And oh man, I can’t wait to have more counter space and a more photogenic kitchen! Rethink my closet. Here’s a little something about me and fashion: I hate shopping. So much that I rarely do it and only justify buying something if it’s on super-sale or thrifted. But the thing about shopping like that is items tend to fall apart after just one or two seasons of wear and those super-sale items are typically made in terrible working conditions (hence the low price). This past year, I’ve been inspired to do more research into where my clothes are coming from and supporting brands who are committed to making clothing ethically. I’ll admit, it takes more time and thought, but I feel better about investing in pieces that are made well and in great working standards that build communities rather than destroy them. Buy a legit lighting setup. The thing about my approach to food photography is I depend on that dreamy natural light to take photos and videos of my cakes. It gets really hard in the Winter (aka now) because the daylight is so short and most of those precious hours are spent at my day job during the week. This year I’m researching different lighting setups so I can mimic that dreamy daylight at night. I’ll let you know if it’s possible! Oh, and this year expect a full look into my food photography setup and tips on taking better food photos. I’m far from an expert, but I do have some things to say.